All internally lubricated parts; engine mounts, flywheel, flex plate, harmonic balancer, intake and exhaust manifolds, mechanical fuel pump, pulleys, ring gear, supercharger, thermostat, timing belt, timing cover, turbocharger, vacuum pump, valve covers, water pump. All internally lubraicated parts; modulator, torque converter, transmission and transfer case mounts. All internally lubricated parts; axle shafts, constant velocity joints and boots, drive shafts, locking hubs, universal joints. Accumulator, compressor, compressor clutch, condenser,evaportor, expansion valve, heater core, receiver drier, temperature control programmer. Booster, calipers, compensating valve, master cylinder, proportioning valve, wheel cylinders. Alternator, antenna motor, blower motor, cooling fan motor, distributor, horn, ignition coil, manually operated switches, mirror motor, seat motor, starter motor, voltage regulator, washer pump, window motor, wiper motor. Cruise control computer, engine control computer and sensors, ignition module and pick-up, transmission computer, suspension computer. Electric fuel pump, fuel injectors, fuel pressure regulator, injection pump (diesel). All internally lubricated parts within the gear box, pump, rack and pinion; center link, idler arm, pitman arm, steering knuckles, tie rod adjusting sleeves, tie rod ends. Ball joints, bushings, control arms, control arm shafts, links, radius arms, spindle, spindle supports, springs, stabilizer bars, suspension compressor, torsion bars, wheel bearings. 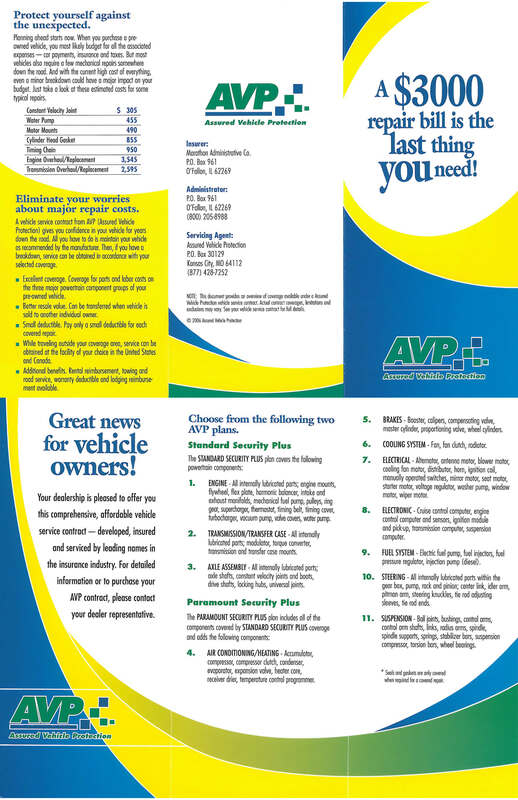 A vehicle service contract from AVP gives you confidence in your vehicle for years down the road. 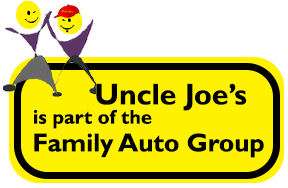 All you have to do is maintain your vehicle as recommended, and if you have a breakdown, your repairs are covered (dependent on warranty selection). Excellent coverage. Coverage for parts and labor costs on the three major powertrain component groups of your pre-owned vehicle. Better resale value. Can be transferred when vehicle is sold to another individual owner. Small deductible. Pay only a small deductible for each covered repair. Additional benefits. Rental reimbursement, towing and road service, warranty deductible and lodging reimbursement available.